Department of Pharmaceutical Chemistry, GITAM Institute of Pharmacy, GITAM University, Visakhapatnam-530045, Andhra Pradesh, INDIA. Correspondence to: Correspondence Dr. Raja Sundararajan; Department of pharmaceutical chemistry, GITAM Institute of Pharmacy, GITAM University, Andhra pradesh, INDIA. Ph no: +91 9160508261 E-mail: sraja61@gmail.com. At molecular and cellular level, antioxidants tend to inactivate harmful free radicals. In current study, methanol extract of Buddleja asiatica (loganiaceae) was screened for its antioxidant activity using biologically relevant methodologies. The whole plant of methanol extract of Buddleja asiatica was screened for its in vitro free radical scavenging assays like DPPH (1,1 diphenyl 2 picryl hydrazyl) assay, nitric oxide scavenging activity, hydrogen peroxide scavenging activity, hydroxyl radical scavenging activity, superoxide anion radical scavenging activity, CUPRAC (cupric ions reducing) assay, DMPD (N, N-dimethyl-p-phenylene diamine dihydrochloride) assay, metal ion chelation assay xanthine oxidase inhibitory activity and lipid peroxidation assay. The IC50 values were found to be 15 μg/ml, 96.2 μg/ml, 35.2 μg/ml, 52.2μg/ml, 40.98 μg/ml, 18.02 μg/ml, 43.6 μg/ml 55.6 μg/ml and 136.2 μg/ml for DPPH free radical, nitric oxide radical, hydrogen peroxide radical, hydroxyl radical, superoxide anion radical, DMPD radical, metal ion chelation, xanthine oxidase inhibitory activity and lipid peroxidation assays respectively. The absorbance of methanol extract of Buddleja asiatica in CUPRAC assay was found to be 0.6772 at the highest concentration tested. Results were compared with commercial antioxidants such as quercetin, rutin, vitamin E, curcumin, gallic acid, EDTA and allopurinol. The strong antioxidant activity of Buddleja asiatica may be credited to the presence of phenyl ethanoid glycosides (E-acteoside,), iridoid glucosides (methylcatalpol, catalpol, aucubin), non phenolic compounds (1-O-beta-D-glucopyranosyl-2-methoxy-3-(2-hydroxy-triaconta-3,12-dienoate)-glycerol), flavonoids (ajugol), sterols (buddlejol, stigmasterol, taraxerol), triterpenoids (13, 28-epoxy-23-hydroxy-11-oleanene-3-one) and essential oils in methanol extract. Buddleja asiatica commonly called as butterfly bush primarily belongs to the family Loganiaceae. It is an erect evergreen shrub or small tree growing up to the height of 1–5m.6 The tree is trichotomously branched and has a bark that can be peeled. It is endemic to Asia and found in most parts of India. Traditionally, it is used in the treatment of many health disorders such as inflammation, rheumatism, skin disease, malaria etc.7,8 Pharmacologically, Buddleja asiatica was screened for antihepatotoxic, antibacterial, hypotensive, anticancer, antifungal and antimalarial activities.9,10 More than 80 compounds including phenyl propanoids, flavonoids, Phenyl ethanoid glycosides, phenylpropanoid esters, non-phenolic compounds, triterpene saponins, iridoid glucosides, benzoates, triterpenoids, monoterpenes, acetogenins, steroids, shikimates as well as other trace elements were identified in the plant.11-14 The present study was aimed to investigate antioxidant activity of methanol extract of whole plant of Buddleja asiatica by using different in vitro assays. All reagents used were of analytical grade. Chemicals ferric chloride, linoleic acid, 2,2- diphenyl-1-picryl-hydrazyl(DPPH), ethylenediamine tetracetic acid (EDTA), potassium persulfate, ferrous chloride, ammonium thiocyanate, hydrogen peroxide, ferrous ammonium sulfate and hydroxylamine hydrochloride were obtained from Aman scientific products, Vijayawada, Andrapradesh, India. Buddleja asiatica was collected from Tirupati (Andhra Pradesh) and further identified, confirmed & authenticated by Dr. Madavchetty, professor, Botany department, Sri Venkateswara University, Andrapradesh, India. The plant was preserved in the herbarium of GITAM Institute of Pharmacy, GITAM University, Andrapradesh, India for future reference (Voucher specimen No -1751). The whole plant was washed, air-dried, homogenized to fine powder and stored under ambient conditions. The powdered and air dried plant material (500 gm) was extracted with methanol in a Soxhlet apparatus. The extraction was done continuously till a clear solvent was observed in the thimble. The excess solvent was removed from methanol extract using a rotary vacuum evaporator and later on concentrated on a water bath. The percentage yield of the extract was calculated. The free radical scavenging activity of Buddleja asiatica extracted with methanol was measured by 1, 1 diphenyl 2 picryl hydrazyl (DPPH) method.15 A stock solution was prepared by dissolving methanol extract in distilled water. From this working solution of different concentration (5, 10, 20, 40, 80 μg/ml) were prepared. A 0.1 mM solution of DPPH dissolved in ethanol was prepared. 1ml of working solution was added to 3 ml of methanol extract of Buddleja asiatica at different concentration. The mixture was shaken vigorously and allowed to stand at room temp for 20 minutes. Absorbance was measured at 517 nm by using spectrophotometer. Quercetin was used as reference standard compound and serial dilutions of standard compound was also prepared. The nitric oxide radical scavenging activity of methanol extract of Buddleja asiatica was measured according to method of Parul et al.16 Various concentrations (5, 10, 20, 40, 80 and 160 μg/ml) of methanol extract of Buddleja asiatica were prepared from stock solution. Two ml of sodium nitroprusside (10 mM) in phosphate buffered saline (0.5 ml) was mixed with different concentrations of methanol extract of Buddleja asiatica and incubated at 30°C for 2 hours. After the incubation period, 1 ml of Griess reagent (1% sulphanilamide, 0.1% N-(1-naphthyl) ethylenediamine dihydrochloride, 2% orthophosphoric acid), phosphate buffer (pH- 7.4) were added. The mixture was then incubated at room temperature for further 30 min and its absorbance was measured at 550 nm. Rutin served as standard. The ability of Buddleja asiatica methanol extract to scavenge hydrogen peroxide was determined by method of Gayathri et al.17 From the stock solution 4 ml of methanol extract of Buddleja asiatica in various dilutions (12.5, 25 50, 100μg/mL) were made as working solution. To this 0.6ml of 4 mM hydrogen peroxide solution prepared in phosphate buffer (0.1 M, pH 7.4) was added. It was incubated for 10 minutes. Absorbance of hydrogen peroxide at 230 nm was determined against a blank solution. The experiments were done in triplicates. Vitamin E was used as reference. The ability of Buddleja asiatica methanol extract to scavenge hydroxyl radical was determined. Working solutions of various concentrations (10, 20, 40, 80, 160 μg/ml) were prepared with methanol extract of Buddleja asiatica.17 To 500 μl of methanol extract, 100 μl of 2-deoxy2- ribose and 200 μl of 1.04 mM ethylene diamine tetra acetic acid (EDTA) were added. Further 200μM ferric chloride (1:1, v/v) and 100 μl of 1.0 mM hydrogen peroxide were added. Finally 100μl of 1.0 mM vitamin C was added. All samples were incubated at 37°C. After one hour 1ml of 1% thiobarbituric acid (TBA) and 1.0 ml 2.8% trichloroacetic acid (TCA) were added to the reaction mixture and incubated at 100ºC for 20 min. The absorbance was measured at 532 nm against a blank. Vitamin E at various concentrations was used as a positive control. Measurement of superoxide anion radical scavenging activity of methanol extract of Buddleja asiatica was carried out by method of Nishimiki et al.18 A working solution of serial dilutions (5, 10, 20, 40, 80, 160 μg/ml) was prepared from methanol extract of Buddleja asiatica. Each dilution was mixed with 1ml of nitroblue tetrazolium (NBT) solution and 1 ml of nicotinamide adenine dinucleotide (NADH) solution. The reaction was initiated by adding 100 μl of phenazine methosulphate (PMS) solution. The reaction mixture was incubated at 25°C for 5 min and the absorbance at 560 nm was measured against blank sample. Curcumin was used as reference compound. Cupric ions (Cu2+) reducing ability of methanol extract of Buddleja asiatica was measured by method of Apak et al.19 From the stock solution of methanol extract, working solutions at various concentrations like 100, 200, 300, 400 and 500 μg/ml were prepared. 1 ml from each dilution was mixed with 0.01M of cupric chloride solution, 7.5 mM of ethanol neocuproine solution, and 1.0 M of ammonium acetate buffer solution. Finally, total volume was adjusted to 2 ml with water and incubated for 30 minutes at room temperature. Absorbance was measured at 450 nm against a reagent blank. Gallic acid was taken as reference. The assay was performed according to the method of Fogliano et al.20 Working solutions of various concentrations (200, 400, 600, 800, 1000 μg/ml) were prepared with methanol extract of Buddleja asiatica. To each dilution of methanol extract, 1 ml of DMPD solution and 1 ml of water were added. The samples were vortexed and incubated in dark at room temperature for 15 min. Absorbance was measured at 505 nm. Gallic acid was taken as reference. Working solution of methanol extract of Buddleja asiatica in various concentrations (100-1600μg/ml) was prepared according to the method of Adjimani et al.21 To 1 ml of test solution, 0.1 ml of 2 mM Fecl2 and 0.2 ml of 5 mM ferrozine were mixed. The tubes were vortexed and kept for 10 min. The absorbance was measured at 562 nm. Distilled water served as control. The ability of sample to chelate ferrous ion was calculated. EDTA was used as reference. The xanthine oxidase (XO) inhibitory activity of the methanol extract of Buddleja asiatica was determined with xanthine as the substrate.22 The reaction mixture was obtained by mixing 1.0 ml of serial dilution of methanol extract of Buddleja asiatica (10-160μg/ml) prepared in 12% v/v dimethyl sulfoxide and 1.9 ml phosphate buffer (pH 7.5). Later, 0.1 ml of xanthine oxidase enzyme solution (0.045 units/ml) and 1ml of 100 μM xanthine was added to assay mixture. The reaction mixture was incubated for 15 min at 25°C. The enzyme reaction was stopped by adding 1ml of 1M HCl and the absorbance was measured at 295 nm against blank solution. Allopurinol was used as standard. This assay was used to determine thiobarbituric acid reactive substances. Rat liver microsomal fraction was prepared by the method of Bouchet et al.23 Methanol extract of Buddleja asiatica (10–160 μg/ml) was prepared in various concentrations. Five hundred μl of liver microsomal fraction, 300 μl of working solution of methanol extract of Buddleja asiatica and 100 μl of FeCl3 (1mM) were mixed. 100 μl vitamin C (1 mM) was added finally. Samples were incubated at 37°C for 1 h and lipid peroxidation was measured using the reaction with thiobarbituric acid (TBA). The absorbance was measured at 532 nm. All reactions were done in triplicate. Vitamin E was used as a standard. The percentage yield of methanol extract of Buddleja asiatica was found to be 6.6% w/w. DPPH is 2, 2-diphenylpicrylhydrazyl, a stable free radical which in the presence of a antioxidant gets reduced to 2,2-diphenylpicrylhydrazine. This reduction was observed by a colour change from purple to yellow. The decolourisation was correlated to decrease in absorbance of the solution. The scavenging of DPPH radical by methanol extract of Buddleja asiatica was monitored and illustrated in Figure 1. The IC50 value (IC50 15.18 μg/mL) of methanol extract of Buddleja asiatica was found to be more than that of standard, Quercetin (IC50 value of 9.5 μg/mL). Sodium nitroprusside has the ability to produce nitric oxide in phosphate buffer saline. The pathways that lead to the discharge of nitric oxide may be either through photolytic decomposition or reaction with thiol group in griess reagent. The generated nitric oxide undergoes addition reaction with oxygen to produce stable nitrates and nitrites. Methanol extract of Buddleja asiatica decreased the concentration of nitric oxide by antioxidant ability. The scavenging activity with the IC50 values 96.22 μg/mL and 48.06 μg/mL for methanol extract of Buddleja asiatica and Rutin, respectively was mentioned in Figure 2. The potential of different concentrations of methanol extract of Buddleja asiatica to scavenge hydroxyl radicals produced by Fenton reaction was measured. By the addition of iron salts to ascorbic acid and EDTA, hydroxyl radicals are generated. Degradation of monosaccharide by condensation with thiobarbituric acid was quantified. The concentrations of 50% inhibition were found to be 52.2 μg/mL and 34.2 μg/mL for methanol extract of Buddleja asiatica and standard compound vitamin-E, respectively. The IC50 value (52.2 μg/mL) of Buddleja asiatica extract was found to be more than the standard. The formation of superoxide radicals when phenazine methosulfate reacts with nicotinamide adenine dinucleotide was studied. Nitro blue tetrazolium gains electrons from superoxide anion radicals and gets reduced to blue formazan. The decrease in the absorbance with the methanol extract of Buddleja asiatica indicated the consumption of superoxide anion in the reaction mixture. As mentioned in Figure 5, the methanol extract of Buddleja asiatica as well as curcumin showed the scavenging activity with IC50 values, 40.98 μg/mL and 18.05μg/mL, respectively. The antioxidant activity of methanol extract of Buddleja asiatica was determined by cupric ions (Cu2+) reducing assay. As mentioned in Figure 6, the methanol extract of Buddleja asiatica as well as gallic acid showed the scavenging activity with absorbance of 0.567 and 0.618 respectively for 50% of concentration tested. However, the activity was less than the standard Gallic acid. The methanol extract of Buddleja asiatica decreased the concentration of DMPD radical. The methanol extract of Buddleja asiatica had a well hydrogen donating ability with an IC50 value of 18.02 μg/ml and the value was found to be higher than that of standard, gallic acid (IC50 value 9.5 μg/ml). The ferrous ions chelating activity of methanol extract of Buddleja asiatica and standard were investigated. The extract showed 9.2%Fe++ ion chelating ability at 100 μg/ml and the standard EDTA showed 14.3% at the same concentration. The IC50 value of the extract was also good when compared with the IC50value of the reference standard EDTA. The IC50 values of methanol extract of Buddleja asiatica and reference compound were found to be 43.6 μg/ml and 18.4 μg/ml, respectively. The Xanthine oxidase inhibitory activity of Buddleja asiatica methanol extracts was studied. 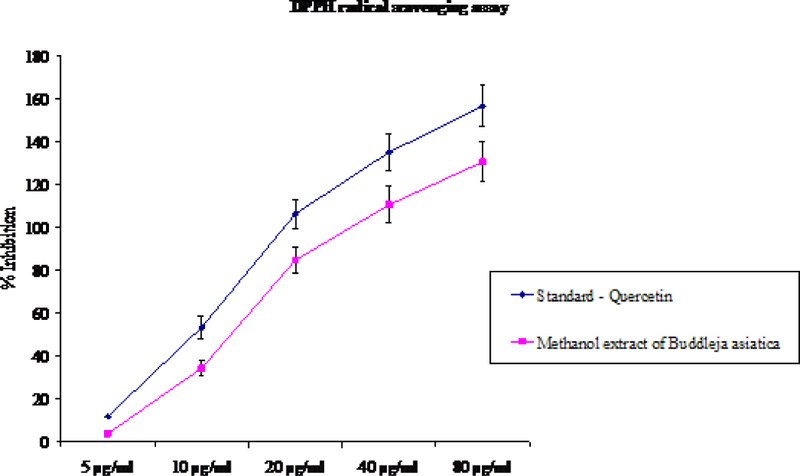 In this study different dilutions of methanol extract and reference compound were tested and a dose response curve was plotted as shown in Figure 9. The IC50 values of methanol extract of Buddleja asiatica and reference compound were found to be 55.6 μg/ml and 19.4 μg/ml respectively. The effect of methanol extract of Buddleja asiatica and vitamin E on the in vitro inhibition of lipid peroxidation was showed in Figure 10. Addition of Ferrous ascorbate in rat liver microsomes generates lipid peroxidation. The extract of Buddleja asiatica showed inhibition of peroxidation effect in all concentrations, which showed 50% inhibition effect at 130 μg/ml. The extract inhibition value was found to be more than the standard, vitamin E (IC50 value 123.6 μg/ml). Scavenging effect of methanol extract of Buddleja asiatica and standard quercetin on DPPH radical. Scavenging effect of methanol extract of Buddleja asiatica and standard rutin on Nitric oxide radical. Effect of methanol extract of Buddleja asiatica and ascorbic acid on hydrogen peroxide radical assay. 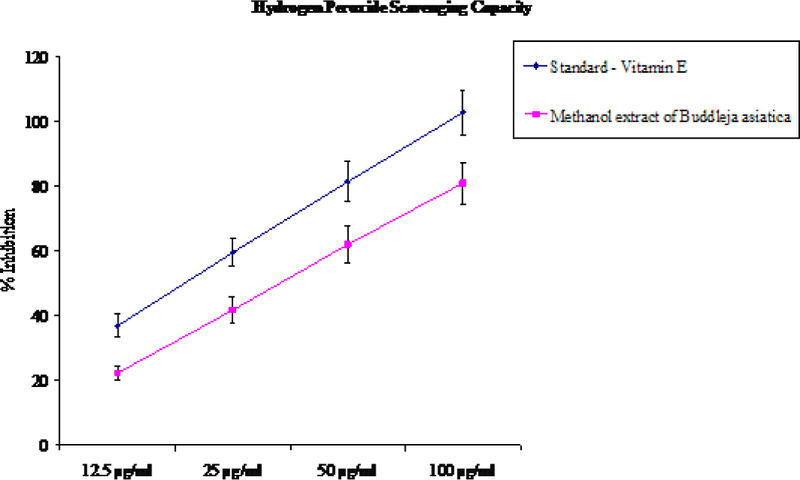 Effect of methanol extract of Buddleja asiatica and vitamin E by hydroxyl scavenging method. Effect of methanol extract of Buddleja asiatica and curcumin on scavenging of superoxide anion radical formation. Effect of methanol extract of Buddleja asiatica and gallic acid by CUPRAC method assay. 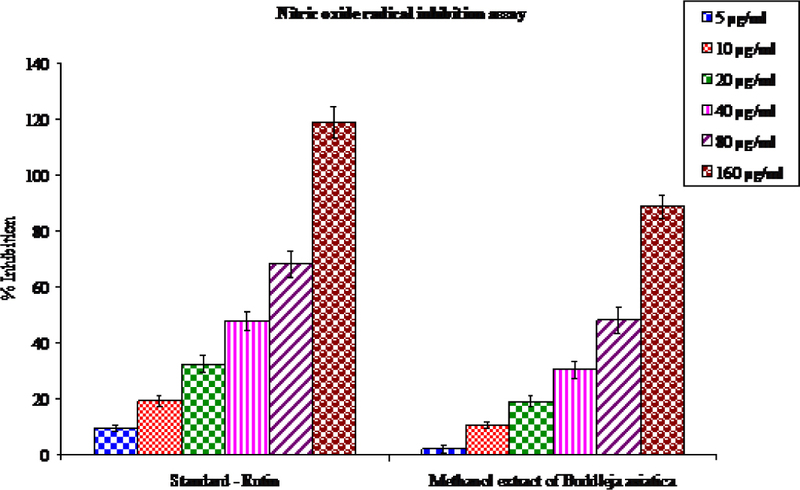 Effect of methanol extract of Buddleja asiatica and gallic acid by DMPD radical scavenging assay. Effect of methanol extract of Buddleja asiatica and EDTA by metal ion chelation assay. Effect of methanol extract of Buddleja asiatica and allopurinol by xanthine oxidase assay. Effect of methanol extract of Buddleja asiatica and vitamin E on lipid peroxidation of liver microsome induced by Fe2+/ascorbate. Present study proved that methanol extract of Buddleja asiatica had good nitric oxide scavenging activity. Few studies proved that flavonoids inhibited nitric oxide release as well as efficiently acted as nitric oxide scavangers.26 Being the precursor, sodium nitro prusside releases nitric oxide which gets oxidized to peroxynitrites and nitrates in the solution. A gradual decrease in absorbance was recorded which was directly related to the concentration of nitrites. The plunge in absorbance may be due to the methanol extract of Buddleja asiatica which competes with oxygen to react with nitric oxide leading to decrease of nitric oxide availability. Hydrogen peroxide naturally gets decomposed to oxygen and water. Nevertheless, in presence of certain metal ions it may react to form cell sensitive hydroxyl radicals. Foti et al reported that non phenolic compounds are better scavengers of hydrogen peroxide since they can donate electrons to H2O2, thus neutralizing it to water.27 Recently El-Sayed et.al reported the presence of four different non phenolic compounds [1-O-beta-D-glucopyranosyl-2-methoxy-3-(2-hydroxy-triaconta-3,12-dienoate)-glycerol, 3 – O - [alpha-L-rhamno pyranosyl-(1-->4)-beta-D-glucopyranosyl-(1-->3)]-[beta-D-glucopyranosyl-(1-->2)] – beta - D-fuco pyranosyl-olean-11,13(18)-diene-3 beta,23,28-triol etc] in methanol leaves extract of Buddleja asiatica.13 From the results, it appeared that the H2O2 scavenging activity of the plant extract is in par with that of the standard. Hydroxyl radicals produced in the presence of a reducing agent like ascorbic acid attacks hydrogen atom of deoxyribose. The degraded sugar molecule reacts with thiobarbituric acid to form thiobarbituric acid reactive substances. The presence of EDTA was recommended since it increased the formation of TBARS to four-fold higher than in its absence. In 2000, Cheng and Breen reported the ability of flavonoids to suppress Fenton reaction. They found that quercetin and luteolin could suppress the catalytic wave of the iron ATP/Hydrogen peroxide system.28 The decrease in the absorbance at 560nm by a flavonoid fraction of Buddleja asiatica implicates the exploitation of hydroxyl radical in the reaction mixture. The present study proved that the extract of Buddleja asiatica had efficient superoxide scavenging activity. In 2008, Liu et al isolated triterpenoids [13, 28-epoxy-23-hydroxy-11-oleanene-3-one and 13, 28- epoxy-21β, 23-dihydroxy-11-oleanene-3-one] from Buddleja asiatica.29 Many studies reported that terpenoids inhibited generation of superoxide radicals. Moreover, the presence of catechol group in terpenoids also helped to trap and stabilize superoxide radicals.30 Discoloration of formazan and decreased absorbance indicates the consumption of superoxide anion by plant terpenoids in the reaction mixture. Further, in vitro antioxidant activity of methanol extract of Buddleja asiatica was determined by exploitation of CUPRAC technique. From the results, it was observed that the reducing power of methanol extract of Buddleja asiatica was good when compared with that of the standard. This assay measured both hydrophilic and lipophilic antioxidants. Many phytoconstituents could act as electron donors or strong reducing agents. In the presence of methanol extract of Buddleja asiatica, copper (II)-neocuproine (2,9-dimethyl-1,10-phenanthroline) complex was reduced to coloured copper(I)-neocuproine complex.31 The reduced cation had an absorption maximum at 450 nm. By increasing the sample concentration range from 100 to 500μg/ml, the reducing power also increased in the dose dependent manner. Through DMPD method, methanol extract of Buddleja asiatica recorded good antiradical activity by reduction of cation leading to decolourisation of reaction mixture. This chain of reactions may be attributed to the presence of antioxidants in methanol extract. Antioxidants scavenged single electron by donating hydrogen to DMPD•+radical.32 This affirms the potency of methanol extract of Buddleja asiatica in dose dependent DMPD radical scavenging activity. The present investigation also demonstrated the chelating effects. Transition metals such as copper and iron catalyse the conversion of hydrogen peroxide to toxic free radicals. Interactions of hydroxyl or carbonyl groups of flavonoids with metal ions can lead to chelate formation. Interestingly, the metal-flavonoid complexes were found to have a much stronger free radical scavenging properties than the free flavonoids.33 Flavonoids like diosmin and linarin isolated from methanol extract of Buddleja asiatica may work by chelating ferrous ions. Hence availability of metal ions to generate a complex with ferrozine was greatly reduced. This study approved the chelating ability of Buddleja asiatica. The current examination revealed that methanol extract of Buddleja asiatica is a potent inhibitor of xanthine oxidase and scavenger of superoxide anion. The enzyme xanthine oxidase catalyse the conversion of hypoxanthine to xanthine.34 Uric acid and super oxide anions are also formed during this chemical conversion. Xanthine oxidase inhibition of the methanol extract of Buddleja asiatica may be attributed to their different polyphenolic compositions. A combination of ferrous sulphate and ascorbic acid proves a good promoter system for inducing oxidative stress. The ferrous ascorbate complex generates reactive hydroxyl radical. Hydroxyl radical attacks the unsaturated fatty acids of liver microsomes causing lipid peroxidation.35 This result in generation of carbonyl fragments called MDA (malonodialdehyde) which react with thiobarbituric acid to form a pink compound asorbed at 532 nm. The methanol extract of Buddleja asiatica and Vitamin E exhibited a steady scavenging impact of hydroxyl group at different concentrations. The marked inhibition of lipid peroxidation by the methanol extract may be due to the presence of iridoid glucosides like methylcatalpol, catalpol, aucubin etc in the methanol extract of Buddleja asiatica. In present study, various in vitro assays were carried out to determine the antioxidant activity of methanol extract of Buddleja asiatica. The extract was found to possess good antioxidant activity which may be credited to the presence of phytoconstituents like steroids, flavonoids, iridoid glucosides, phenyl ethanoid glycosides, phenyl propanoid esters, terpenoids etc in the methanol extract. Present study also showed that methanol extract of Buddleja asiatica exhibited significant antioxidant potential similar to standard antioxidants with a marginal difference. Further meticulous studies are required to substitute methanol extract of Buddleja asiatica as a natural drug for the treatment of diseases caused by free radical accumulation. The antioxidant potential of methanol extract of Buddleja asiatica is evident from the data collected in present study. The antioxidant activity was evaluated by subjecting the methanol extract to various in vitro free radical scavenging models like DPPH (1,1 diphenyl 2 picryl hydrazyl) assay, nitric oxide scavenging activity, hydrogen peroxide scavenging activity, hydroxyl radical scavenging activity, superoxide anion radical scavenging activity, CUPRAC (cupric ions reducing) assay, DMPD (N, N-dimethyl-p-phenylene diamine dihydrochloride) assay, metal ion chelation assay xanthine oxidase inhibitory activity and lipid peroxidation assay. Results were compared with commercial antioxidants such as quercetin, rutin, vitamin E, curcumin, gallic acid, EDTA and allopurinol. The antioxidant potential of Buddleja asiatica validates its use in traditional medicine. The authors are thankful to the management of GITAM University, Visakhapatnam, Andhra Pradesh, India, for providing necessary facilities to carry out the research work. Dr. S. Raja: has completed B. Pharm from Institute of Pharmaceutical Technology, Annamalai University and M. Pharm (Pharmaceutical chemistry) from The Tamilnadu Dr.MGR Medical University, Chennai. He obtained his PhD Degree in phytochemistry and pharmacology from Department of Pharmaceutical Technology, Jadavpur University, Kolkata,West Bengal. Currently he is working as an Associate Professor in the Department of Pharmaceutical Chemistry GITAM Institute of pharmacy, GITAM University, Visakhapatnam. Dr. S. Raja has carried out extensive research in the area of phytochemistry and pharmacology involving plants standardisation, extraction, isolation, characterization and screening of bioactive molecules. He has guided several Doctoral Scholars and published over 80 research papers in National & International Journals. Conflicts of interest CONFLICT OF INTEREST Authors have no conflict of interest.